Many years ago, while halfway through my graphic design course, myself and a couple of friends decided the YMCA student hostel just wasn't the same anymore, and it was time to find a flat. A friend from my course mentioned that her sister happened to have a spare lounge suite and dining suite, which we promptly snatched up. This became pretty much the only furniture in our student flat. Especially as only one couch made it up the stairs, the other was far too big. That one eventually found a new home with some other poor students. 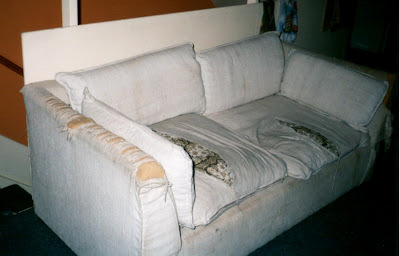 A year or two later, it had started to fade, and I was a little tired of the foam chip cushions. So I decided to buy some foam squabs and cover them. This time I bought some remnant furnishing fabric. Some in a red/black fleck, and some black fabric. I covered one squab with this. Since then, I went to London, and lent the couch to a friend. I eventually picked it up again about a year after I got back. Then I got married, so the project stayed on the backburner. After the wedding I went to Fabric House to buy some proper furnishing fabric for it. This was a little more expensive than the first time round, but I like to think it was worth it. I told the lady in the shop I would bring in pictures of it when i finished. I haven't forgotten! That was nearly two years ago, and at a snails pace compared to the first time round, I have slowly made progress. 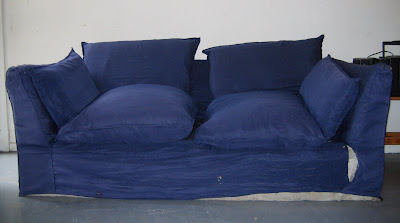 I just need to sew the covers for the cushions now, and it's all done. It now lives in the studio/spare room, and I have grand visions of reclining on it whilst designing some new range of something. The big reveal will come once it is finally finished, and I have had time to take some nice pictures. So don't hold your breath, but now I've put it out there, I might have to make sure I finish it sooner rather than later.